금동여래입상(金銅如來立像)은 대좌(臺座)와 광배(光背)가 없고 몸체만 남아있는 전체 높이 32.3㎝의 불상으로 민간에 소장되어 있는 것으로는 비교적 큰 편에 속한다. 전래한 장소나 소장하게 된 경위는 알 수 없으나 일제시대 일본인으로부터 입수하였다고 전해진다. 전체에 도금의 흔적이 남아 있으며, 곳곳에 푸른 녹이 덮여있다. 머리에는 작은 소라 모양의 머리칼을 붙여 놓았으며 정수리 부근에는 상투 모양의 큼직한 머리(육계)가 있으나 높이는 낮다. 얼굴은 네모나고 눈은 옆으로 길게 올라가 있으며, 코와 입은 작고 볼에 두툼하게 살이 올라 있다. 원만하면서도 평면적인 얼굴 모습은 통일신라시대 불상의 양식을 잘 반영한 것이라고 하겠다. 넓은 양 어깨에 걸친 옷은 길게 내려서 U자형의 옷깃을 보이면서 몸 전체를 감싸고 있다. 가슴에는 속에 입은 옷과 띠매듭을 나타내었는데, 이것도 통일신라시대 불상에서 나타나는 대표적인 특징이다. 오른손은 들어 손바닥을 보이고, 왼손은 허리 아래로 내려 역시 손바닥을 보이고 있는 모습이다. 불상의 뒷면에는 머리와 몸체의 아래 위에 큰 구멍이 뚫려 있는데, 이것은 주조 기술에 따르는 것으로 역시 통일신라의 금동불에서 나타나는 특징이다. 전체적으로 몸에 비해 머리가 큰 편으로 작달막하고 살찐 모습을 보여주고 있는데, 옷의 표현에 있어서는 생동감과 부피감이 많이 줄어들고 있다. 조각 표현은 평면적으로 굳어지는 경향을 보이고 있으며, 옷주름도 형식화가 되어가고 있는 통일신라 후기의 불상으로 보인다. 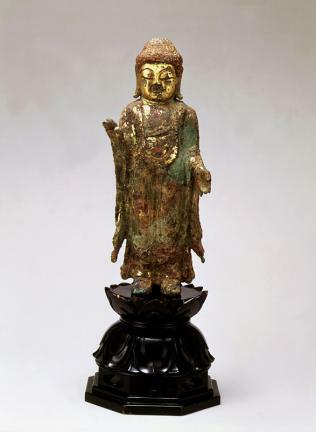 This is a standing Buddha statue 32.3 centimeters high without a pedestal or mandorla (Buddhist halo of light). It is fairly large for something in the keeping of a private citizen. Where it was first made or how it was found is still unknown. However, it is said that it was acquired from a Japanese person during the Japanese Occupation. There are signs of plating, and there is blue rust all over it. There is a large topknot shaped usnisa (a protuberance symbolizing supreme wisdom) around the crown of the curly hair, but it is not tall. The face is square, the eyes are elongated sideways, the nose and mouth are small, and the cheeks are plump. The face is voluminous but flat, resembling the carving styles of the Unified Silla period. The neck is short with three wrinkles, which makes the Buddha look oppressed and fat. The right hand is held up with the palm upward and the left hand is held below the waist with the palm showing. The beobui (sacerdotal robe) hangs on both broad shoulders with "U" shaped folds that cover the entire body. There are undergarments and knotted bands on the chest, which is also a characteristic of standing Buddha statues from the Unified Silla period. On the back of the statue, there are large holes on the head and the body which were used in the casting of gilt-bronze statues in Unified Silla. Overall the head is large compared to the body and looks fat and short, and the beobui reduces the animation and volume. The carving itself is flat and stiff with the folds in the clothing carved in the formal style of the late Unified Silla period.